26 Mart 2019 Salı 13:04 - 3 reads. habitats of animals and plants are protected and the construction of the landscape to prevent: that is The goal of two initiatives to which the environment have been launched by associations on Tuesday. The associations speak of a double initiative. The nature in Switzerland, it is bad, write to the initiator in a message. Important habitats, threatened to Deplete or disappear, and with them species of animals and plants. On a political level, conquer in spite of the alarming state of biodiversity at a standstill, landscapes would be concreted over. you don't want to accept, Pro Natura, BirdLife Switzerland, the Swiss heritage and the Swiss Foundation for landscape protection longer. Together, they launch desire two people: the Initiative "For the future of our nature and the landscape" (biodiversity initiative) and the Initiative "Against the construction of our landscape" (landscape initiative). The biodiversity initiative is to require that the Confederation and the cantons shall provide for the securing and strengthening of the biodiversity of the necessary land, resources, and instruments available. For significant interventions in the protection of objects of the Federal government overriding interests of national importance should have to be present. The landscape initiative aims to Build outside the building zone. Clear rules should be enshrined in the Constitution. The initiators want to ensure that the protection of the landscape can be softened. 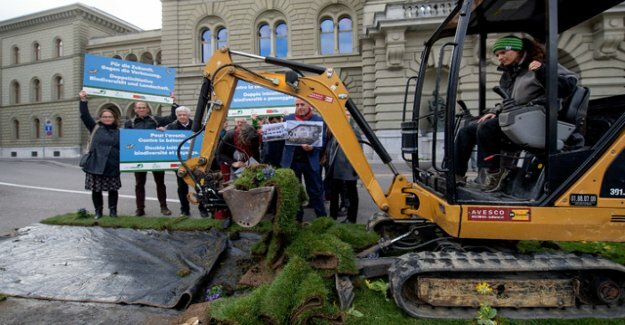 The Swiss Federal Council's planned rules to Build outside development zones not to go to the initiators far enough.